Nintendo of Europe have announced the latest content to be released for their Virtual Console and Nintendo DSiWare services throughout the region, with an evident lack of WiiWare titles this week. 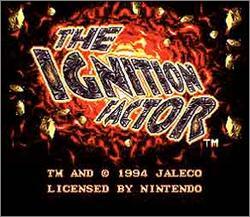 The classic fire-fighting game, The Ignition Factor, is back, and this time on Virtual Console! Take control of a brave firefighter as he battles to save people from towering infernos and flame-filled factories. You have a large variety of equipment to help you with your task, plus the hero isn’t afraid of getting physical and kicking objects, climbing ropes and jumping to help him get to all areas. But time is definitely not your friend, as the fires get gradually worse and you slowly run out of breathable air! Different types of fire need to be extinguished with different methods, so you’ll need to use your equipment to the best of your ability to save the day. Aim to use the fire engine and your team-mates to extinguish all the flames you can see! Can you keep your cool and save everyone in a constantly changing environment? Join the exciting adventures of Leo the tiny lion as his Sunday afternoon flight suddenly ends with a spear through his engine! Evil shaman Makatu and his savage tribe of Tuba warriors chase Leo to trap him forever. Only YOU can help him find his way back to friends and family. In Successfully Learning English Year 3, pupils will solve exciting exercises to learn English in a playful way. The little vampire Freddy motivates the children and helps with tips. Challenge your friends to the ultimate Table Hockey game on your Nintendo DSi. Find out how many computers you can defeat with Championship mode, or challenge your friends in Multiplayer mode and show them who’s the true champ! This is the game Hockey fans have been waiting for!